I will forever associate the Singapore Sling with summer holidays, Greece, and dimly lit bars that served drinks that could not be legally called ‘cocktails’. These lurid concoctions were almost 99% fruit ‘juice’ and about 1% discount sweet liqueur. It’s not surprising that I stayed well away from Tequila Sunrises and Singapore Slings for decades afterwards. Which is kind of a shame. A proper Singapore Sling is a far cry from the those technicolour impostors, although the recipe has definitely strayed into kitsch territory over the years. 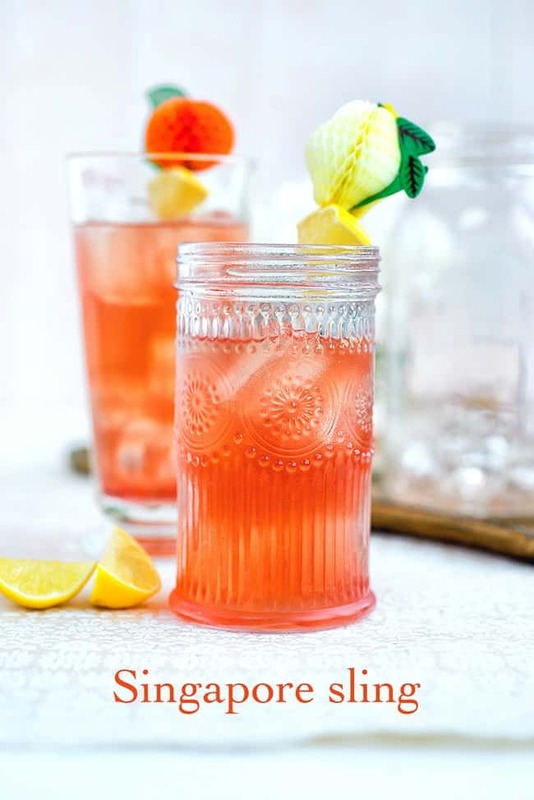 Originally called the Gin Sling (a sling is a drink composed of spirit and water, sweetened, flavoured and served cold) the Singapore Sling has so many variations it’s hard to figure out which recipe is closest to the original which dates back to 1915. In the interests of, ahem, science I did some research and this recipe from The Bar appears to be pretty authentic – and entirely delicious. Leave out the pineapple juice and cocktail cherries and stick to premium spirits for a refreshing gin based cocktail that is perfectly sophisticated – apart from the retro cocktail sticks perhaps! Fill two tall glasses with fresh ice. Add Gordon’s London Dry Gin, cherry brandy, benedictine, lemon juice and grenadine to a cocktail shaker filled with ice. Shake briefly until a frost forms on the shaker. Strain into the glasses and decorate with a lemon wedge. This recipe is sponsored by thebar.com. Make sure you visit the site for tons more classic cocktail inspiration – I have my eye on a few recipes I want to try. I need to make more cocktails, your posts are such an inspiration! You make them look so beautiful. This is no exception and it almost looks healthy! oh my, the colours on this is amazing. I love your cocktail posts Lucy. I want one of these! This looks so refreshing, the colour is very pretty too. Sounds great, a gin cocktail I gave yet to try! I love the colour of that singapore sling, so vibrant and summery! This looks so good! I have never made a cocktail before, but I would love to try sometime! Sounds like a plan. When are you free some some serious pretending?